I’ve just got back from Vegas over the weekend where I had a blast attending the AWS re:Invent 2016 conference. I am still supercharged by AWS CEO Andy Jassy’s keynote session where he used the ‘super-powers’ theme to introduce a whole new range of AWS services: the first superpower was ‘Super-sonic Speed’ for all the new EC2 compute instances; then came ‘X-Ray vision’ where new AI and machine learning services such as Recognition and POLY were introduced, and then there were powers of ‘Immortality’ and ‘Flight’ for advancements in AWS database related services. As I listened to the keynote I couldn’t help but think that superpowers is what turns people like you and me into superheroes—and at Riverbed we like to call such people Cloud Heroes. I greatly enjoyed my riveting conversations with the re:Invent attendees for my specific areas of focus such as AWS networking, VPC connectivity, security and hybrid clouds. Seeing the audiences eyes beam looking at the demo of our single click deployment of SteelHead in the cloud on the exhibit floor was a rewarding experience in itself—not to mention the overwhelming positive feedback that we received for our cloud solutions in general. Riverbed’s single click deployment of SteelHead for Cloud offers unique capabilities for cloud-heavy enterprises and cloud customers in general. Rooted in its SD-WAN pedigree of high automation this solution addresses the two most common pain-points in cloud: managing connectivity and performance. Firstly this solution makes it insanely simple to manage and securely interconnect VPCs in cloud and connecting VPCs in cloud to your physical networks. And secondly with just click of a button you are able to vastly accelerate the performance of cloud-hosted applications and cloud migration for end-users irrespective of where they reside in the real world. Riverbed’s SteelConnect AWS cloud VPC solution not only addresses inter-regional VPC connectivity but also supports transitive peering across multiple VPCs. Just as seamless is interconnecting AWS VPCs to their physical network assets in the data center and branch offices. A robust and powerful SteelConnect orchestration manager provides a high level of automation for common VPC management and cloud networking functions taking the ease-of-use attribute to a whole different level. The same SteelConnect orchestration engine has the ability to spin up a SteelHead for Cloud (WAN optimization) instance with a click of a button in any customer VPC, in any AWS global region, for optimization of cloud workloads. Performance optimization is enabled through reduction of overall bandwidth usage and acceleration of mission-critical cloud workloads, making this solution industry-unique and one of a kind. A SteelConnect Cloud Gateway and SteelHead for Cloud pair is what comprises the AWS stack in every VPC. 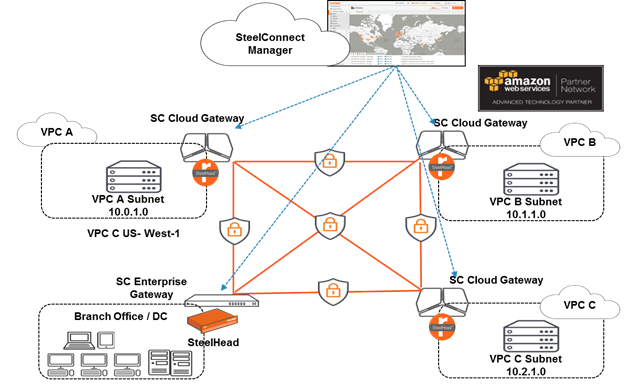 The SteelConnect Cloud gateway securely interconnects VPCs and physical networks using IPSec tunnels by forming a fully meshed auto VPN network between all the cloud and physical sites. Thus any organization is able to seamlessly and securely manage their cloud networks to scale without worrying about the complexities of VPCs, subnets, IP addresses, security groups and routing configurations in the cloud. SteelHead for Cloud performs the function of performance optimization using techniques such as deduplication, TCP transport optimization and protocol optimization. High levels of automation and ease-of-use are the hallmarks of this solution. An important feature to note is that SteelHead fully supports auto-discovery in the cloud; traffic that needs to be optimized is automatically redirected to the SteelHead for optimization of workloads. This feature obviates the need for installation of any specialized Discovery Agent software on cloud VMs for purposes of traffic redirection, and also greatly simplifies the configuration for on-premise SteelHeads by not having to configure fixed-target rules. SteelConnect Manager is a centralized SD-WAN-based management and orchestration platform that auto detects customer VPCs in cloud and sets up policy configuration. It also performs traditional SDWAN functions such as ZTP, centralized policy-based configuration and WAN virtualization for SDWAN-enabled branch offices and data centers. A lot of the cloud-heavy enterprises require high availability and reliability for any cloud deployed solution. The AWS stack in the above solution comprising of Cloud Gateway and the SteelHead for Cloud pair supports HA by replicating both of these components in a separate AWS Availability Zone so that in the event of a failure of any of these components traffic can continue to be securely routed and optimized. At the commercial end both the SteelConnect Gateway and SteelHead for Cloud products support a highly attractive usage-based hourly pricing model and are available on AWS marketplace for easy procurement and consumption. And lastly, as widely acknowledged, the future of this cloud phenomenon and appetite is much bigger than any single cloud provider can satisfy and there is plenty of room for multiple cloud providers. This is evident from the growing customer requests to be able to interconnect their workloads within multiple cloud providers. To meet this growing need, this same solution will soon be supported with Microsoft Azure cloud. So organizations that like to interconnect cloud workloads in AWS VPCs, Azure VNETs and physical networks seamlessly with a single unified management platform, and simultaneously optimize end-to-end performance for their cloud workloads will be able to do so very soon just with a click of a button. Now isn’t this a super-power worthy feature in itself? How about I take the liberty to invoke a super-power myself: ‘Geo-leaping’ defined as the ability to move instantaneously from one location to another without physically occupying the space in between. Get it? I am not kidding – feel free to look it up. And I have my cape ready—do you have yours?